These are suggested retail prices for mobile home roof material. Click Mobile Home Parts & Supplies for all of your mobile home roof repair needs. These components are used to make this type of mobile home roof system. The lumber is used to frame an area that will hold the foam. It is then covered with a roof roll. The roof roll is folded over the lumber and a drip rail is attached. Mobile home roof systems can be installed over just about any type of roof. 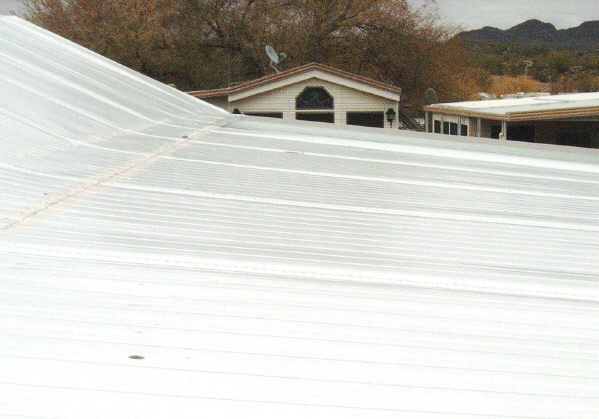 It is very common to roof over shingled roofs and aluminum awnings. The photo shows a Park Model and an awning with a new insulated roof system.